Don't let the sun go down on your anger and don't let this day pass without saying sorry to those you have wronged. This card's background has the branches of a Japanese cherry blossom tree in the top left corner and a swirl of pink, green, red, black, and purple colors mixed together across the rest of the card. 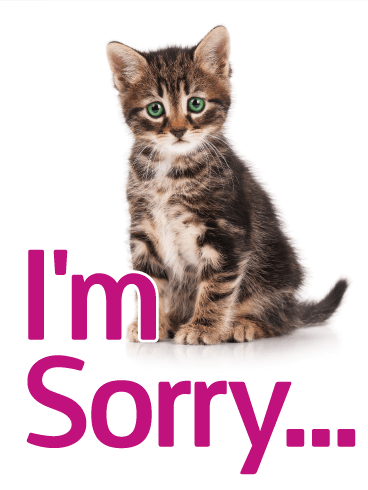 Send this I'm Sorry card to show how sorry you are. Are you sorry for something you have done? Do you wish you could let the wronged person know that you regret your actions? Now you can with this I'm Sorry card! 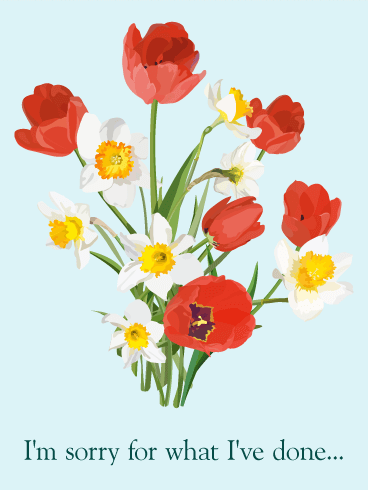 The background is a pretty sky blue with a bouquet of red poppies and white daffodils in the center. The message is written on the bottom in dark blue. 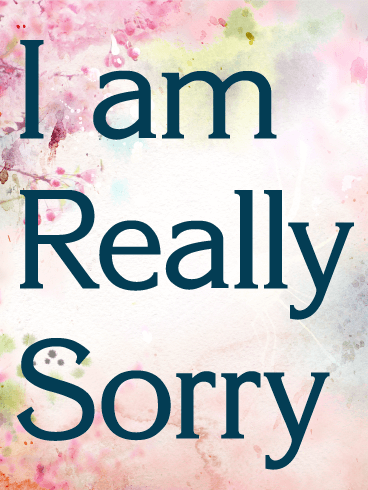 Send your apologies with this I'm Sorry card before the day is over! Have you done something you regretted? Do you want to send a sweet apology to the person you wronged? If so, you have found the perfect card! 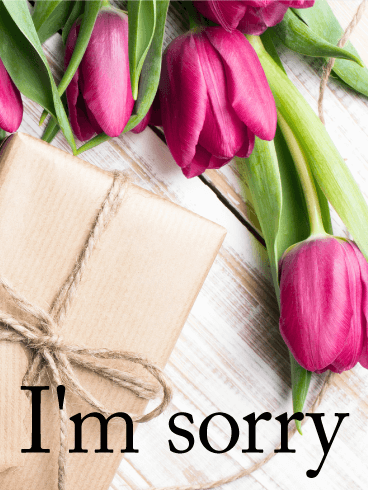 This I'm Sorry card features bright pink tulips, which symbolize good wishes, and a brown paper-wrapped package that is tied with twine. Both items sit on a white-washed wooden table. 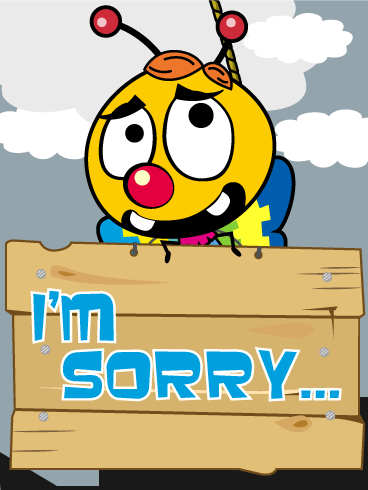 Send this card to say "I'm sorry" today! Did you hurt someone you care about? Do you want to tell them you are sorry for what you have done? Send them an I'm Sorry card to let them know. This card features a cute gray kitten who is looking at the card's receiver with a sad expression. The message is written at the bottom in large pink lettering. 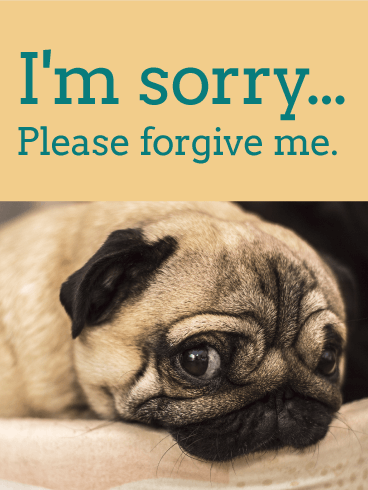 Use this I'm Sorry card for your apology today. If you want to ask forgiveness for something you have done wrong, send a cute I'm Sorry card to the person you have wronged. This card's message is written in blue at the top of the card, which has a tan background. At the bottom, an adorable pug looks sad as he lays on a cushion. Send this card to say how sorry you are today! Sometimes you need some humor to help your apology soothe a hurt. If that is what you need for your apology, send this Piñata I'm Sorry card to the person you have hurt. The background features a gray sky with white and gray clouds. A brightly colored Bee Piñata has a sad expression as it holds a wooden sign with an apology written in blue. Use this card to right your wrongs with humor before the hurt continues.